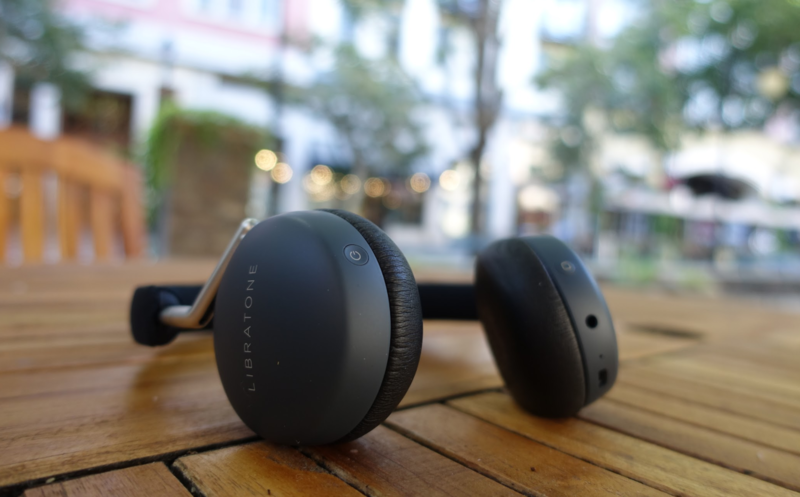 Danish audio studio Libratone foray into the on-ear headphone market is an impressive first effort, delivering rich audio in a comfortable design with a few extra perks. 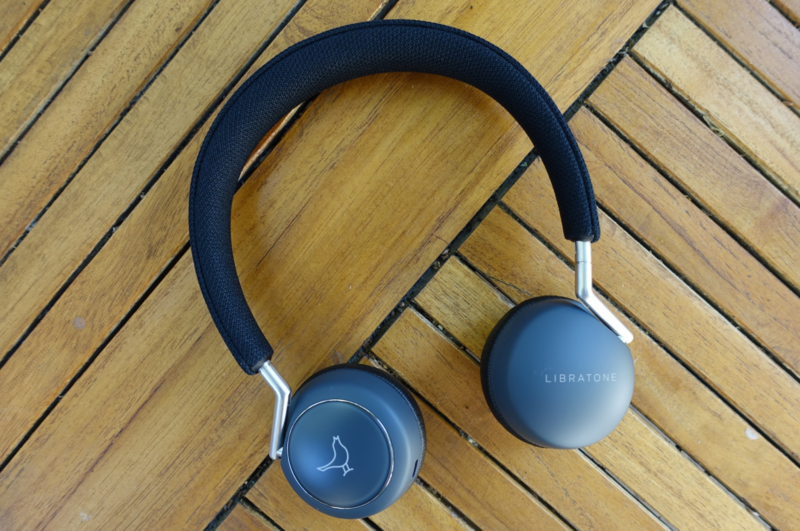 Minimalists will appreciate the clean lines of the Libratone Q Adapt for its clean and sophisticated style, and these wireless Bluetooth headphones come with a clever smartphone app that brings even more customization to your audio experience. Priced at $249, the Q Adapt not only competes against Bowers & Wilkins’ P3 headphones, the simple silhouette makes these headphones appear as a cross between the P3s and rival Bang & Olufsen’s stylings. While the highlight feature of the Q Adapt is its wireless connectivity—you can pair the headphones to your laptop, smartphone or smartwatch using Bluetooth 4.1, and the cans also support the higher quality aptX audio standard—audiophiles can also use these headphones as a wired set alongside a DAC for even better audio quality. Available with stainless steel accents and either a Cloudy White—which looks like a classy light gray tone—or Stormy Black colorways, the Q Adapt’s design is very simple. Our Stormy Black review unit comes with a black mesh colored headband wrapped around a metal frame. You’ll find angled stainless steel arms on either side, connecting the headband to the earcups. Each earcup is wrapped in a very soft synthetic leather, and the color matches the headband. The earcups are also padded with memory foam, providing for a very comfortable on-ear experience. The memory foam padding not only makes the Q Adapt feel comfortable when it’s worn, but also helps to isolate outside noise. The 7-ounce headphones feel light when worn, and the mesh headband fits comfortably against your head—it doesn’t push against your head and you can enjoy a long listening session without fatigue thanks to design. The headband is tight initially, but you can bend and stretch them to loosen them up. If you’re listening for a long time—especially in the heat of summer—the synthetic leather will make your ears sweat a little, but this is a problem affecting all on-ear and over-ear headphones that use leather or a leather substitute for earpads. The earcups also swivel to lay flat, which is great to stow for travel or to hang around your neck when you’re not actively using them to listen to music. Unlike Bowers & Wilkins’ P3, the headband doesn’t fold for an even more compact footprint, but the lay-flat design shouldn’t be a problem for most users. Music and volume controls are performed on the right earcup’s capacitive touch panel. There is a learning curve to memorize the various different gestures and taps used to control your music, and there are quite a few gestures to remember given how advanced these headphones are. Adjusting the volume is fairly intuitive—all you’ll need to do is slide your fingers around the perimeter of the earcup’s touch surface. For the most part, the Q Adapt’s gestures work well—provided you remember all the taps and gestures—though sometimes the capacitive touch panel did have problems discerning some gestures. The touch interface is a clever idea to keep the design of the headphone clean, similar to how Bragi implements music control on the Dash and Dash Pro wireless earbuds. The left earcup houses the power button, charging port and the jack to connect a cable for a wired listening experience. 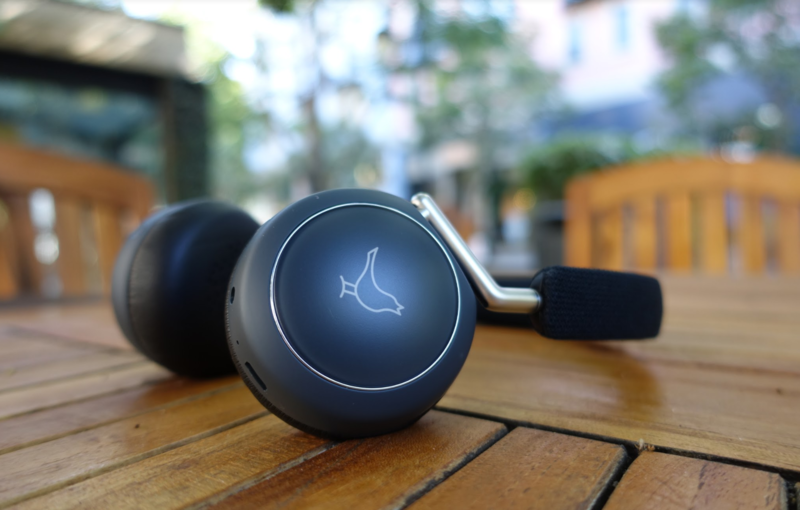 The Q Adapt performs well with balanced sound when noise cancellation is disabled. Audio purists may not appreciate the enhanced audio tuning from Libratone, but the overall effect is pleasing without making your music feel muddy—the lows are still punchy, and there is plenty of crispness in the mids and highs. There is some degradation in fidelity when noise cancellation is turned on. Additionally, you can dial in the EQ and use the Extra Bass option if you want to highlight the lows. The app gives you added flexibility on controlling how you want your music to sound. Compared to the Bowers & Wilkins P5 Wireless that we recently reviewed, the Q Adapt didn’t have as tight of a handling on audio with more complex tracks, and the sound stage didn’t feel quite as wide. Overall, however, the Q Adapt sounds much more pleasant than many of the headphones in the market around this price point. You’ll also need a day or two to break in the headphones. Out of the box, audio fidelity sounded a bit muddied, but after a day, the Q Adapt took on a life of its own and sounds a lot brighter, punchier and crisper. If you’re looking for more precision out of your music, you can also use the 3.5mm audio cable. When using the Q Adapt as a wired set, you’ll hear the finer subtleties and nuances of your tracks. This isn’t a problem unique to the Q Adapt, however, as a wired connection delivers better audio fidelity on most, if not all, wireless headphones. The Q Adapt comes with active noise cancellation, which uses microphone to detect the ambient noise signals around you and pumps in a noise wave on the opposite spectrum to effectively cancel background noise. This is great for commuters, travelers and office workers who need to block out the surrounding noise, and Libratone’s CityMix feature gives you even more flexibility. There are four adjustable levels of noise cancellation with CityMix. Essentially, when you dial down the noise cancellation, you’ll be able to control how much of the ambient noise you let in and can hear. This is useful if you’re in an urban environment and are using the headphones on a walk to work, for example, as it keeps you aware of the traffic noises around you. CityMix can be controlled on the earcup or through Libratone’s app. Even at the highest settings, CityMix doesn’t completely block out your surroundings, but it does a good job of muffling out offensive chatter. Another clever gesture that the headphone supports is called Hush. By using the palm of your hand to cover the earcup, you can pause music briefly, allowing you to hear participate in a quick conversation or hear important announcements on a train or plane during your commute. In addition to controlling noise cancellation, Libratone’s Android and iOS app also gives you more control of your music playback. You can change the EQ and even update the headphone’s firmware through the smart app. Noise cancellation performs well, but adjustments can be a bit tricky. Because CityMix can let in some of the background noise on some settings, it can also bring in and amplify wind noise. Additionally, if you have sensitive ears, the Q Adapt’s active noise cancellation implementation can feel like your ears are placed under constant pressure—like if you’re underwater or at high altitudes. This means that active noise cancellation can become uncomfortable if you’re enabling this feature over extended durations. Libratone claims that a charging time of less than three hours yields more than twenty hours of active listening time—and that’s with active noise cancellation enabled. I found these claims to be true. During my testing, I routinely charge my Q Adapt unit once weekly, and I use the headphones for a few hours each day throughout the entire week, weekends included. In general, battery life is on par with competing wireless headphones in this class. The headphones charge via the included microUSB cable. If you run out of power before you can recharge, you can also listen to the Q Adapt as a wired experience. With its companion app and versatile noise cancellation settings, Libratone’s Q Adapt brings a lot of control to tech-forward users. 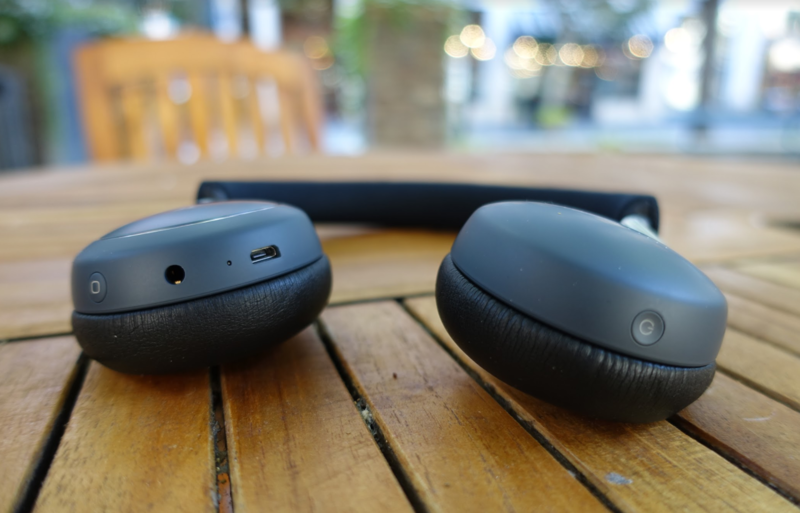 Punchy wireless tuning, a clean and minimal design with touch-sensitive controls and adjustable noise cancellation help make the Q Adapt stand out. However, priced at $249, the Q Adapt faces stiff competition from headphones in the $200-$349 range. Active noise cancellation, for example, can degrade audio fidelity. You can get better noise cancellation by paying a little bit more for Bose or better audio fidelity for a $50 premium on the Bowers & Wilkins P5 (B&W’s cans do not have active noise cancellation, however). As a package, the Q Adapt offers a lot of versatility and flexibility, and tech-forward users may appreciate the extra controls that the app provides.